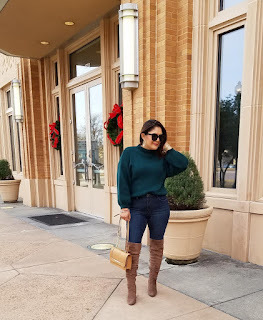 My Favorite Denim, Sweater, and Boots! A guide to looking fabulous while maintaining a budget. I show you how to look chic, street style, and modern without breaking your bank! Especially for those of us who are stay-at-home moms & who keep our families on a budget. Join me in my journey to looking and feeling amazing with classic and trendy fashion looks for less! Happy Tuesday Loves! 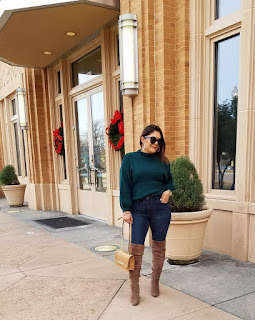 Today's blog post will be shorter than usual because I just wanted to direct link today's outfit and a few of my favorite jeans and sweaters! Some are not currently available online and sold out(sorry) but I am linking similar styles! 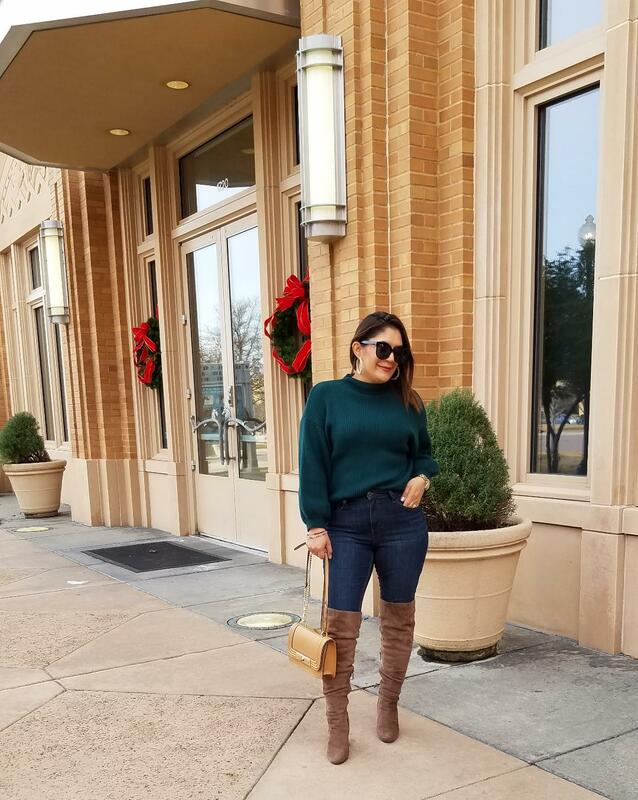 I love Texas days in late Fall and into Winter where we get that good all you need is a sweater, jeans, and boots kind of day! While I love layering, sometimes I feel like I look bulky and more top heavy than I normally am! And while I love being a part of the Like To Know It app, some days I dislike that I cannot link my exact purchases! So, I try and choose the items most similar and least expensive! I am not a Like To Know It savvy pro yet, so bare with me! Although my sweater I am wearing today is no longer available online, I am still linking it in any case you like it and want to be added to their list once it becomes available! But I have linked my exact jeans! And my Aldo bag was a sale find at my local Ross, but Ive found a similar style from Macy's! And I have linked my exact boots below! Okay, I think that this pretty much sums up today's look guys! I love pairing hunter green with taupe and dark denim! There is just something about the colors that compliment one another! Remember, never be afraid to try mixing colors! You might just fall in love! I love and appreciate each and every one of you that takes the time to stop by and read my blog! Thanks! Fab Five Fashionistas: #AllTogetherNow The T-Shirt Edition! I am sure most know the story, but for those who don't, I have met four amazing women via social media, we started out following each other, then finding that we all shop at most of the same retail stores, and now built relationships that have allowed us to know each other past just a social media post! The first collaboration we decided to do was with New York and Company because, well we ALL shop it! We all love Gabrielle Union Collection and Eva Mendes Collection! We all have one thing in common that is for sure, and that is the love for style and fashion everything! Five women with the same passion for style, trends, and all things fashion! Let me start with saying that this collaboration is special because the campaign from Gabrielle Union is just what we are! We are five women who are #alltogethernow in the name of fashion! The Skirt Edition: How to Style Skirts for Summer! 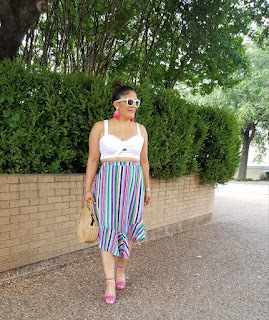 Summer is right around the corner fashionista friends, followers, and fellow blogger's! And I know you all know that I say it all the time, Texas heat is bad! Yes, we get the triple digits, dry heat, some Summer's we go with hardly any rain! So how am I going to slay looks in triple digit heat? I am keeping the fabrics light, flowy, and easy! 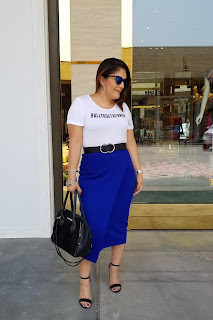 Skirts are always a favorite of mine for Summer, and I love styles like pencil skirts, short skirts, maxi skirts, ruffled skirts, and high hem/low hem skirts! And this Summer I will be styling them with pretty tops, crop tops, off the shoulder tops, and tank tops! All while keeping the fabrics as light as possible so I don't over heat! Hello 2019! The Valentine's Day Edition! Hello 2019! Welcome back my Fashion and Style Babes! 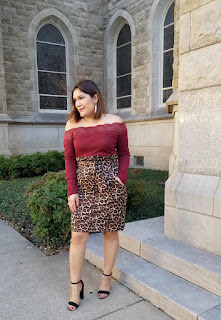 I wanted to kick off 2019 by putting together some Valentine's Day inspired looks, and of course, for less! For my faithful followers and readers, you all know I love a good bargain! For my new followers and readers, I shop clearance racks, resale shops, and thrift stores a lot! Sometimes, we tend to buy clothing that we maybe wear twice, but for the most part, most buy and wear once! And if that is the case, then clearance, resale, and thrift shopping is for you! Buying clearance for items you won't wear over and over is what I recommend! What I Love The Most! Follow For Fashion & Style!